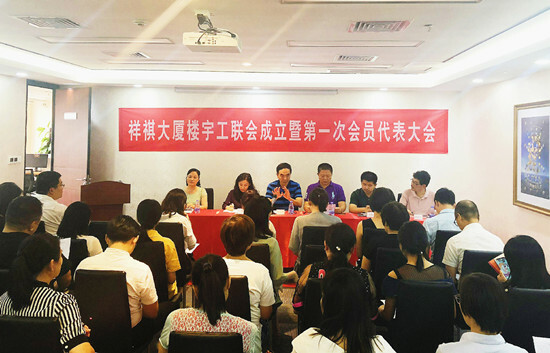 On August 3rd 2018, Cheung Kei marked the establishment of the Cheung Kei Building Trades Union Federation by holding the first congress of its members in the Cheung Kei Building in Shenzhen. Attendees included Executive Vice President of the Cheung Kei Group Chen Xiaoxia, Director of the Cheungkei's Chairman's Office Yang Zhenning, Vice Chairman of the Futian District General Trade Union Liu Dongsheng, District Headquarters Publicity Department Minister Zhu Chang, Chairman of the Shatou Street General Trade Union Chen Jiejun, Vice Chairman Shao Jianhao, Chairman of the Xinhua Community Trade Union Huang Xiaoting, along with other representatives of Cheung Kei Group and enterprise trade unions stationed in the Cheung Kei Building. As a prime golden business icon on Shenzhen's Binhe Boulevard, the Cheung Kei Building houses the group's headquarters and offers a combination of commercial space and comprehensive business services. The building covers a total construction area of about 35,000 square meters and hosts 38 enterprises comprising a total of 2500 employees. 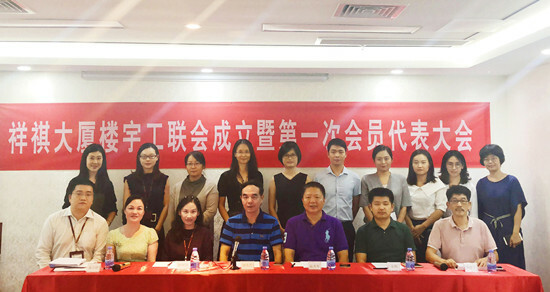 The decision to establish the Cheung Kei Building Trades Union Federation and to setup a preparatory work group was made in April 2018. This was the result of much communication and research to meet the current situational needs of trade union work in the new era. It comes under the leadership of Futian District's Federation of Trade Unions and Shatou Street Federation of Trade Unions and is in accordance with the relevant provisions of the Trade Union Law of the People's Republic of China, the Constitution of the All-China Federation of Trade Union” and the Provisions on the Work of Enterprise Trade Unions (for Trial Implementation) and is in accordance with the actual situation of the Cheung Kei Building. 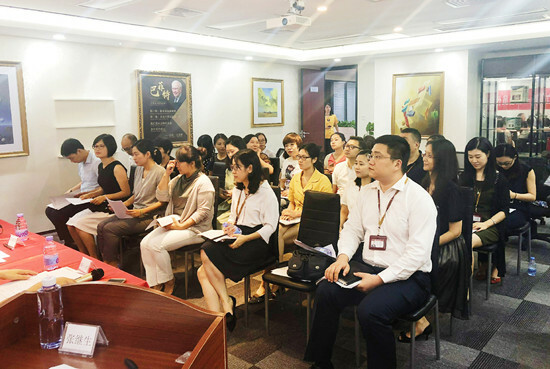 Preparatory work will be carried out by local trade union federations and existing trade unions already established within the Cheung Kei Building, as well as relevant management representatives of CEM and other trade union employees. In recent months, the preparatory group's work has included the setup of twelve trade unions that serve thirty-five enterprises, the recruitment of more than 2400 members, making recommendations of members of the Trades Union Federation and preparing for the federation's first congress. All work has been carried out under the leadership of superior trades unions and with the strong support of enterprises based in the Cheung Kei building. Eleven members of the Trades Union Federation were elected from a shortlist of twelve recommended candidates via democratic ballot. The federation's chairman and vice-chairman were also voted for. 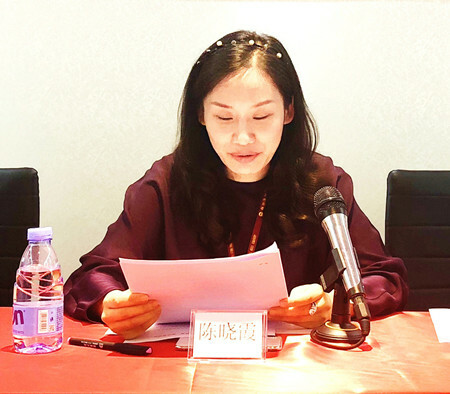 The newly elected chairman of the Trades Union Federation, Chen Xiaoxia, gave a speech saying that creating harmony within Cheung Kei Group would remain central to the federation's efforts to protect the legal rights of workers and enterprises as it carries out its work. Their aim is to create a harmonious, orderly environment that satisfies superiors, allows enterprises to feel welcome and where workers can put their trust and feel at home. 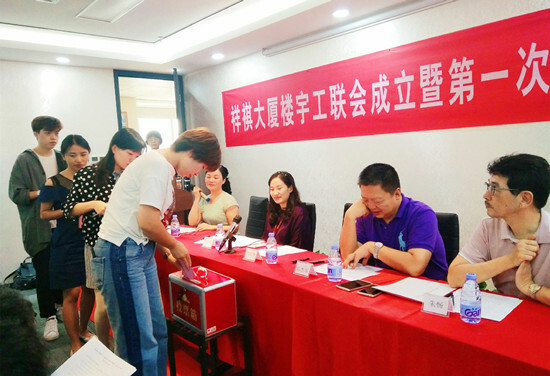 Liu Dongsheng, Vice Chairman of Futian District Federation of Trade Unions, offered his congratulations to the newly established Trades Union Federation and its members and expressed his desire for their work to go smoothly. Attendees sang the national anthem to close the meeting.